There was this really cute commercial that played the whole time I was pregnant that had an adorable, little girl throwing a tea party and her mom bringing her popcorn for the snack. Her older brother and Dad smell the popcorn and want to have some. She covers her tea table and says “Tea Party Only!”. The next scene shows the Dad and brother in boas and tiaras sipping imaginary tea and sitting in very tiny chairs while eating their popcorn. When we found out that we were having a girl my hormone-laden mind was worried that my husband might be disappointed that he wasn’t going to have a son (this baby was obviously going to be our one kick at this can-so to speak). He thought I was being silly and had no problem telling me but I wasn’t reassured until he kept pointing at that commercial and saying how much he was looking forward to a tiara and boa (maybe I should have been worried about other things at this point 😛 ). So yesterday, Madison, Daddy and Grandad had a tea party. 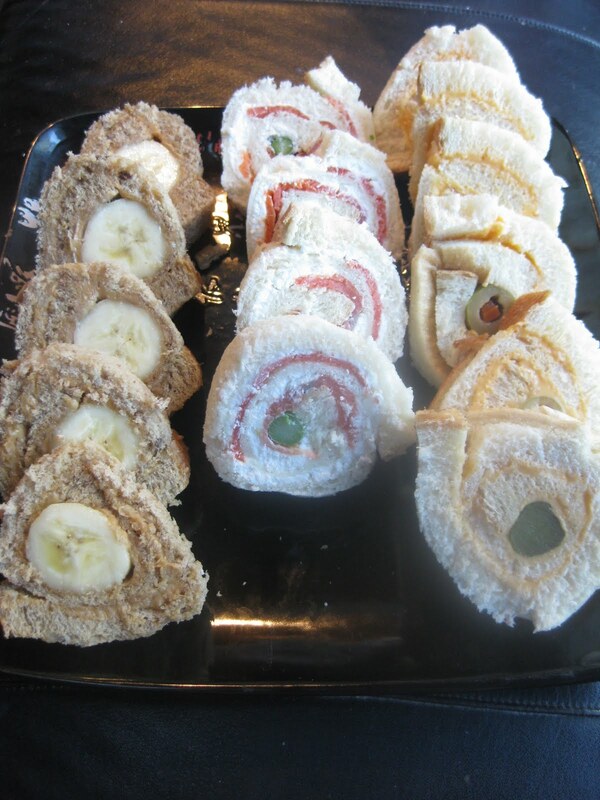 I made pinwheel sandwiches like my mom used to make for special occasions when we were little. They look very fancy but are REALLY easy to do up. I’ve seen them at specialty grocery stores for heart-stopping prices since they are now considered “retro food”. They would be great to bring on a picnic or for a kid’s birthday party. 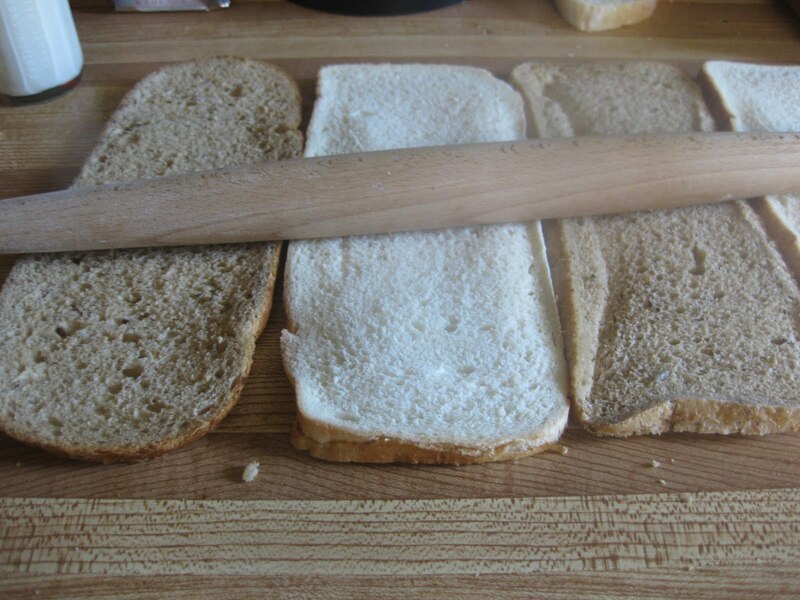 At the grocery store ask the bakery to slice a loaf of bread for you horizontally (you need a sandwich loaf of bread to do this also called a ploughman’s loaf). I usually do one white and one whole wheat. When you get home take the long slices and slightly flatten with a rolling pin. 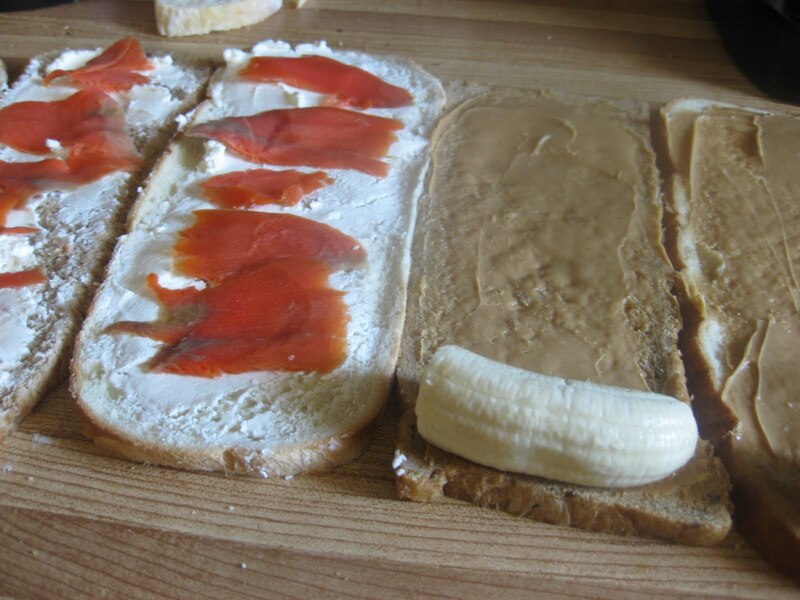 Spread with a variety of fillings. 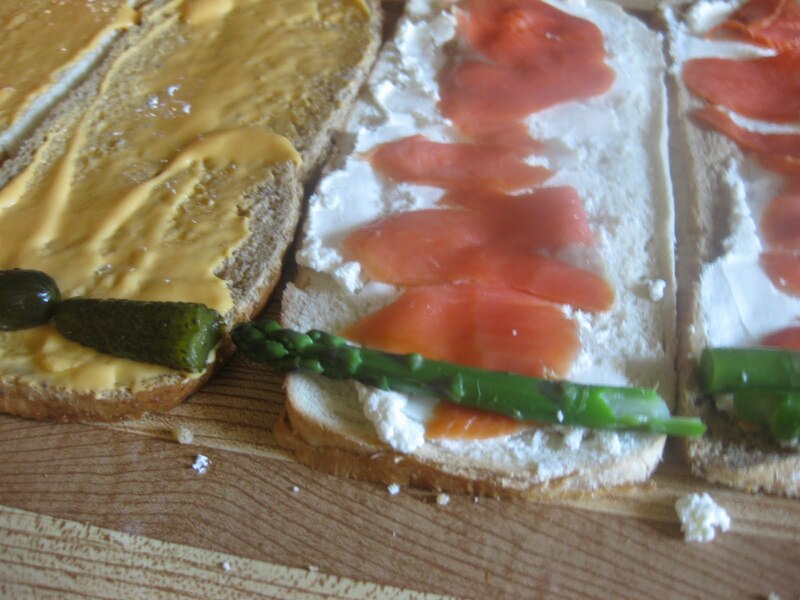 We had; peanut butter and banana (dip the banana in lemon juice or it will be very unappetizing), cheese whiz (you have to do cheese whiz-that’s what my Mom always did) and olives, and chevre with smoked salmon and blanched asparagus. Mom also always made egg and salmon salad but I have an extreme aversion to canned salmon (doesn’t it smell like cat food?). Roll (starting at the garnish end) and wrap in cellophane. Chill for a couple of hours (or overnight) and slice into rolls, trimming the ends of the crusts. Sit on pink princess chairs while eating. Tiaras are optional but advisable. Oh. So. Cute.Miss – so far – has had one real tea party. With much-diluted hot chocolate in my special blue espresso cups (with saucers), that my mom bought with that exact purpose in mind.Fake tea parties – in the tubby and in the pool – we have all the time.Because having a girl and NOT having tea parties would be wrong.Oh, and Jr loves them too. Of course.Awesome, awesome sandwiches. Probably. So does Miss. Jr, not so much, although I'm sure he's still high on his (surely) coffee-flavoured morning breast milk.